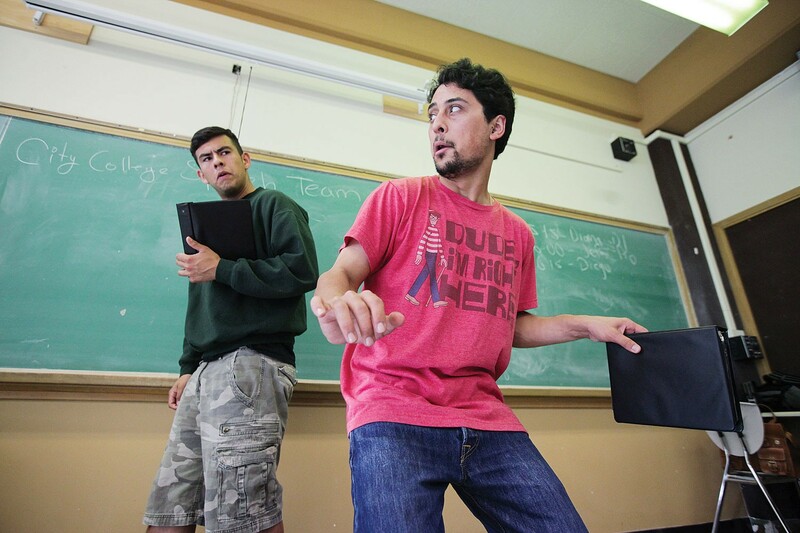 Diego Perez and Zachary Herrera rehearse a piece that was presented during a national tournament in Portland, Ore. The pair provided their take on last year’s immigration protests in Southern California. Diego Perez and Zachary Herrera stood side by side, matching black folders in hand, as they waited for the room to become silent. Simultaneously, the City College of San Francisco students opened their binders, looked up at the audience and began delivering a much- rehearsed oral interpretation piece at a recent practice session for the school’s top-ranked speech and debate team. The performance — a mixture of original oratory and news clips, poetry and other literature — was both theatrical and poignant. “Following a stream of contentious protests in Southern California, U.S. Customs and Border Protection announced Thursday that it will no longer send busloads of undocumented immigrants to San Diego,” recited Herrera, 21. “A protest in Murrieta, Calif., turned back three buses of undocumented migrants from a border patrol center, where they were expected to be prosecuted,” Perez, 20, chimed in. The oration kicked off the nearly 10-minute oral interpretation designed to highlight the students’ take on the U.S. border crisis, where last year there was a substantial increase in the number of Central American children trying to enter the country after fleeing their homelands. Robert Hawkins, the assistant coach of CCSF’s forensics team, came across the topic while reading a news article about protests over immigrants in the Southern California town of Murrieta. He decided the topic was worth exploring as an oral interpretation performance piece. The team, including Perez and Herrera, pored over articles about the matter and spent “hundreds of hours” crafting the speech, Hawkins said. This weekend, Perez and Herrera delivered the immigration piece to a panel of judges at the American Forensics Association National Individual Events Tournament at Lewis and Clark College in Portland, Ore. It is the most prestigious speech tournament in the country. It was the second year in a row the team qualified for the tournament by taking top honors at competitions throughout the school year, said Nathan Steele, director of CCSF’s forensics (speech and debate) program, which includes limited preparation speaking, platform speeches and debate events, along with oral interpretations. Of CCSF’s 30-member team, six took part in the Portland tournament. But the team is unfazed by that reality. It is ranked No. 1 in its region, above every other four- and two-year university in California, Nevada and Hawaii. Before the Portland tournament, Perez, Herrera and the other members, many of whom have been part of speech teams since high school, were honing their skills on performance pieces that typically touched on social-justice issues and current events. “Our students bring rich experiences into the classrooms, when it comes particularly to the oral interpretation events ... because they have a good diversity of experiences,” Steele noted. It is such experiences, both in and out of school, that lend a voice to the subject matter that team members call authentic. “It’s like bringing the things we learned to life,” said team member Myla Calilong, 22, who also competed in Portland this weekend. In Portland, Calilong performed a segment about the language barrier that her friends and family encounter every day. “The speech [is] an attempt to bring me closer to my roots,” she said. Calilong and the other team members have already racked up dozens of awards, mainly at local and state tournaments. The team is even on track to double the number of awards it won in the 2013-14 school year, said Steele. CCSF Chancellor Art Tyler said the team mirrors the school community. Laura Dudnick, a Bay Area native, covers education and planning for The San Francisco Examiner. She previously worked as a senior local editor for Patch.com, and as the San Mateo County bureau reporter and weekend editor for Bay City News Service.